Even if you are on a budget- do not skip the honeymoon! Trust me, you will both want to get away after all the hype and stress of the wedding. I admire couples who are able to take an extended vacation; we unfortunately did not have the luxury of that much time off work (in total we took 10 days off for our “wedding week” and our honeymoon). 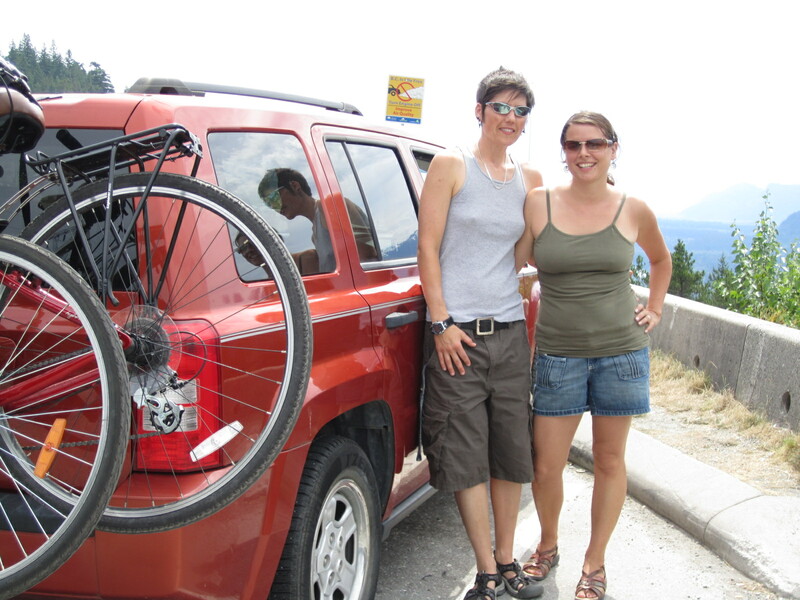 So we chose to stay local and enjoy the world-class resort two hours from Vancouver- Whistler! This was my sweetie’s area to arrange, since I was organizing most of the wedding. I’m so glad I delegated that task to her, many months before. All I knew was where we were going (and I’d strongly dropped hints for a spa experience), everything else she planned was a surprise! We got to travel in style in our new Jeep Patriot (well, new to us, it’s a 2008) that was a gift from my Aunt in exchange for my old Toyota going to my 16-year-old cousin. Yes, they won the prize for largest wedding gift! We stayed at the Marketplace Lodge, which provides furnished suites right in the Village. Excellent location- we could walk and bike everywhere, and great prices (we got our third night free!). To save money we brought some groceries with us to cook our own meals, but we did enjoy one fancy dinner out and breakfast on the morning we left. 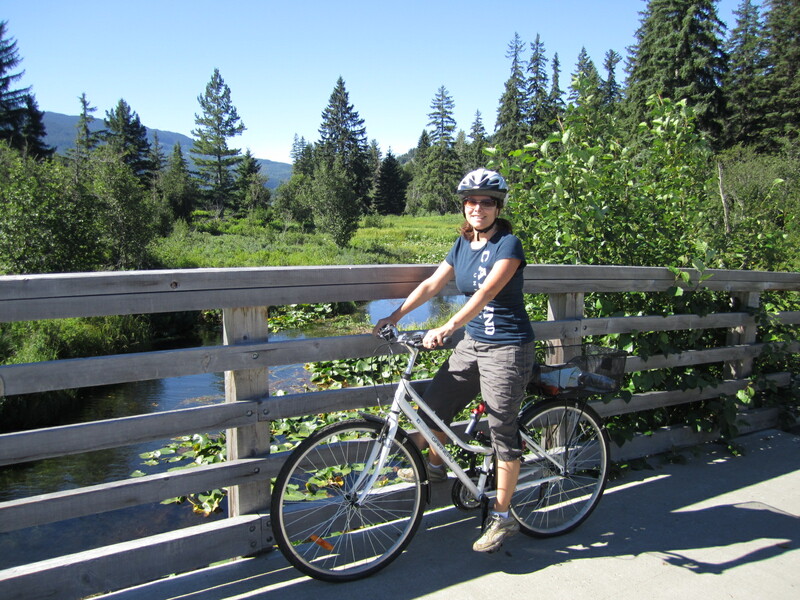 Our first day was all action, as we started the day with a bike ride around Alta Lake, and then in the afternoon went on a trek with The Adventure Group. 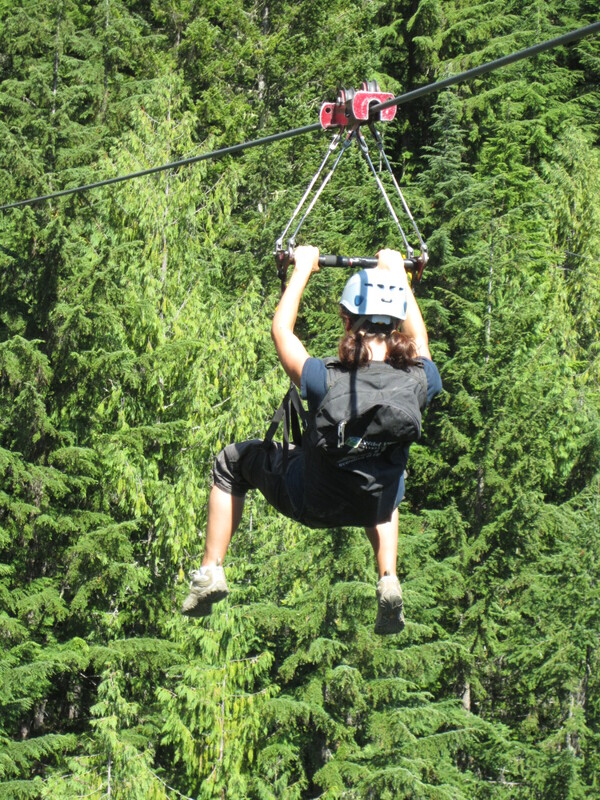 We did the Zoom Lines- four really fast zip lines. It was so much fun! Since it was the August long weekend (BC Civic Holiday) there were free concerts every night in the Olympic Plaza. Saturday night we got to see Spirit of the West! 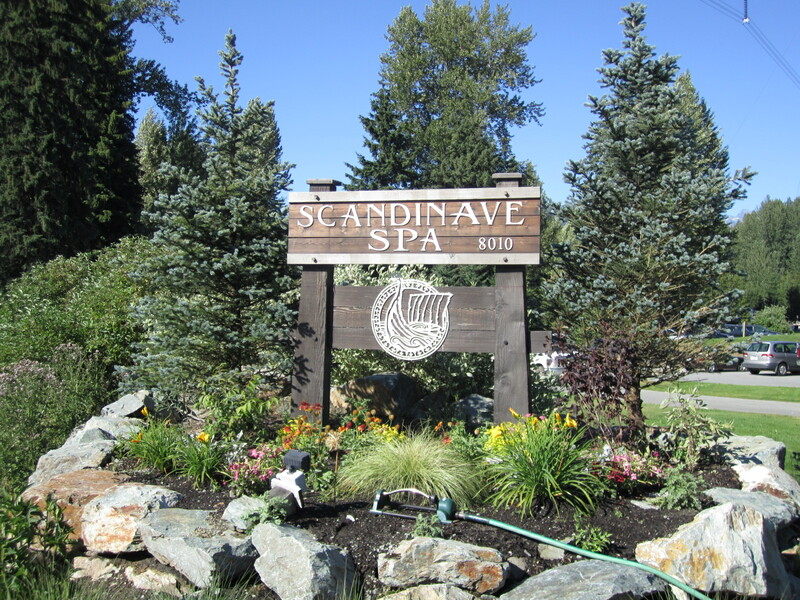 We spent Sunday relaxing- first swimming and sunning at Alta Lake, and then spending the afternoon at Scandinave Spa. This experience was like no other, Scandinave is so amazingly beautiful and peaceful. After our hour-long, Swedish couples massage, we enjoyed two hours in the hot pools, eucalyptus steam room, Finnish dry sauna, and the hammocks. I hope you’re getting the idea here. 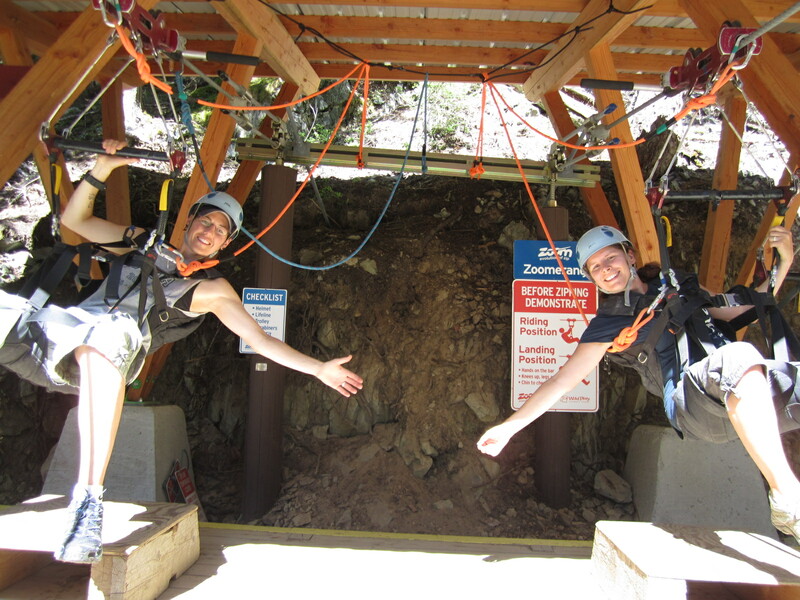 A one-of-a-kind experience and decent prices- highly recommended! Where did you go, or are you planning to go, for your honeymoon? 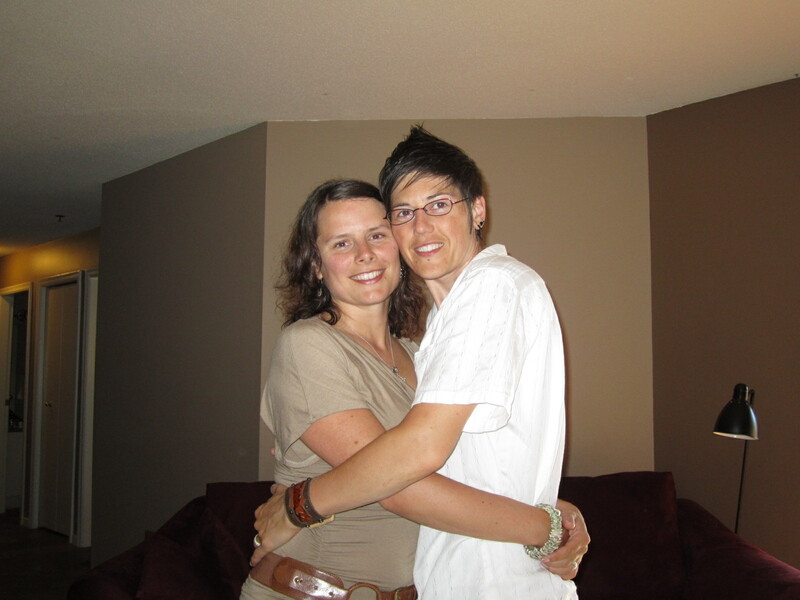 Last night my fiancée and I (hmmm… still getting used to that, I like how it sounds!) had our bridesmaids over to hang, chat a little about the wedding, and watch Bridesmaids! I had them going for a few minutes, until I finally told them I was just kidding. We all had a good laugh, and they were very relieved. Everyone loved our choice of colour scheme, and very happy with our decision to have them wear black. My girls will wear black dresses and I’ll add colour with shawls and their flower bouquets, and my partner’s “butch-maids” will wear black vests and dress pants, white short-sleeved shirts, coloured ties to match the shawls, and flower boutonnieres. I think it will look really sharp. Half of them had already seen the movie, but they all wanted to see it again. We had a riot, laughing so hard. I particularly loved the character of Megan, the chubby, straight-shooting future sister-in-law. We assured our gals that we didn’t want to go to Vegas for our bachelorette, or have puppies given out as favours (even with pink berets), and please, don’t surprise us with Wilson Phillips on our wedding day. LOL! Even though the movie was a silly comedy, it did get me thinking about friendships. I definitely do not want the planning of my wedding to create any wedges between my friends and I. Similar to the movie plot, some of my ‘maids are single and not in as rosy a place as I am. It’s tough when I want to share my joy and all my plans and ideas, but then I hold back because I don’t want to be insensitive. It just feels rude to show off how happy I am. As well, I am going to do my best to not demand too much of their time, and to always be grateful for their help and emotional support. I think that done right, this experience can bring you and your bridesmaids closer together, and in my case I hope that we are even better friends after the wedding is over! Has anyone had any negative experiences with their Bridesmaids? How about really positive ones? What are you doing to ensure your friendship survives the wedding? A few weeks ago I went to my local library to look for wedding books. I love online searching, but my eyes get tired from staring at the screen too long, and I do a lot of work on the computer at work, so I wanted some good ol’ fashioned books. I was amused to discover that they are cataloged in the “Folklore and Customs” section. Happy to find there was quite a large selection, I set about trying to determine which ones I would enjoy and benefit the most from reading. I have devoured almost all of them already, finding so much useful and interesting information. The only book that didn’t speak to me, which I put down after a chapter and a half, was The Wedding Guide for the Grownup Bride. The author was primarily describing her personal experience of marrying for the first time at age 46, and the book did not seem to offer practical suggestions for wedding planning. 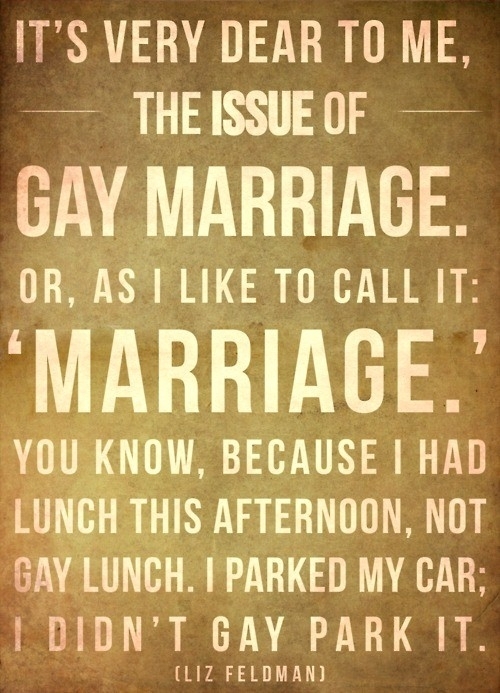 The funniest to read were the Anti-Bride Etiquette Guide and the Gay and Lesbian Weddings. Chock-full of interesting anecdotes, wedding ideas, and historical facts, I thoroughly enjoyed both of them. The Eco-Chic Weddings book also gave me a lot to think about. I have been concerned about the environment since long before it was trendy, I guess I was born “green”. She offers a ton of suggestions on how to make sure your wedding isn’t wasteful or harmful to the environment, and that you aren’t unwittingly supporting unethical industries (such as dirty gold or conflict diamonds in your jewelry, sweatshops or child labour for your clothing, and South American flower farms for those pretty bouquets). How to Have a Big Wedding on a Small Budget was entertaining to read, albeit quaint and old fashioned. I was pleased to find that many of her suggestions to cut costs were options my partner and I had already considered. For a historical look at the customs surrounding marriage, I learned a lot from A Bride’s Book of Wedding Traditions. It is fascinating to look at how marriage has evolved over the ages, and how different cultures celebrate the occasion. 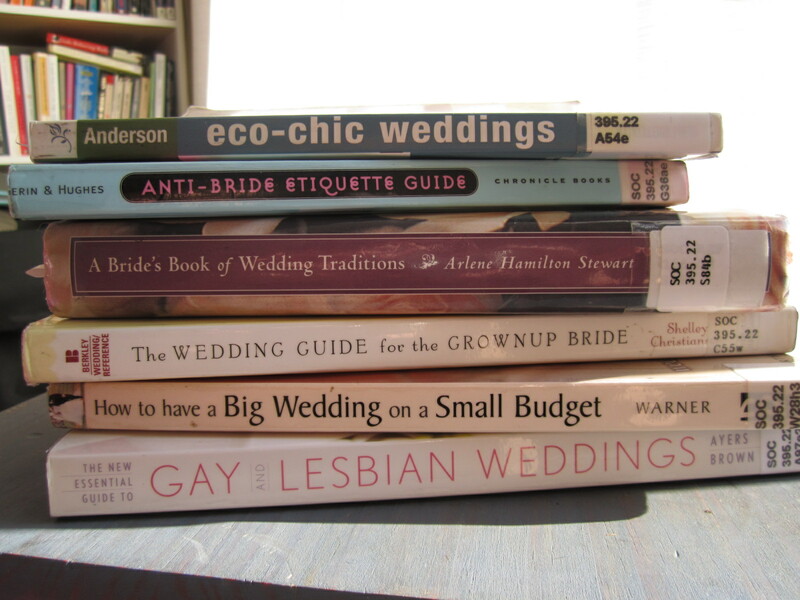 So, to my fellow brides-to-be, I recommend a trip to your library to see what you discover for yourself! We always love it when we can sleep in on the weekend, make a nice breakfast and relax. This particular Saturday in June happened just like that, with my girlfriend making delicious pancakes, and us having the time to enjoy the sunny morning. Around 10:30 or 11am, she asked if she could play me a song on the guitar that she’d been working on. I knew she had been taking lessons again, and I was very proud of her for learning the instrument. She was clearly very nervous, but I thought it was because she had never really sung a song for me! Half-way through the song it started to dawn on me that this song was speaking about strong commitments, and at the end when she sang out my full name and asked “will you marry me?” I was already crying. I had hoped she would propose at some point (we had been hinting at it for a few months) but she had completely taken me by surprise. Through my laughter and tears I of course said yes! Being a brat, I made her get on one knee and ask me again. I wanted to experience that little tradition! She had already given me a custom-designed silver “promise” ring last summer, so on this day she gave me a lovely silver necklace. The whole proposal was perfect- so beautiful and personal and a day we will never forget! We are getting married this August on a big ferry-boat that’s been renovated into a banquet space, that is permanently docked in the waters of the Burrard Inlet, North Vancouver, BC. It will be an enchanted summer evening, with lots of whimsical and DIY touches. Our big, beautiful, Pagan, lesbian wedding!